Montauk beaches are iconic of Long Island. Montauk was an area originally occupied by the Montauks - Native Americans of the Algonquian tribe. It is located on the most eastern part of the south fork of Long Island in the town of East Hampton. The natives then sold the land to English settlers from East Hampton where the English grazed cattle and began to build forming some of the current historic landmarks and buildings. 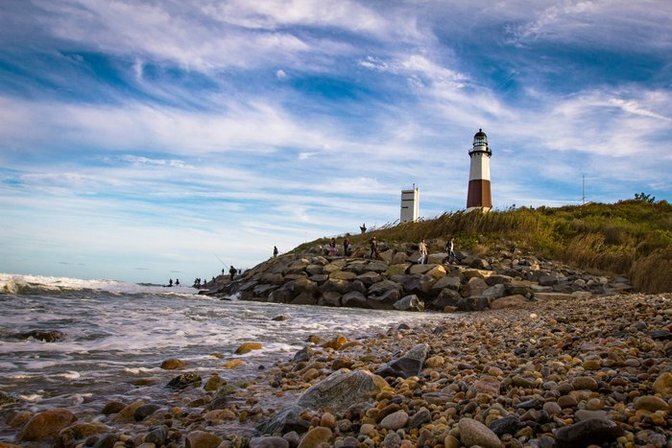 Not only is Montauk filled with history, but also with many attractions and plenty of things to do. Don’t have any plans for the summer? Montauk is the place to go if you are looking for a place to spend the day, have a weekend getaway, or even stay for the entire season. Residents, visitors and tourists crowd the town for some seasonal fun. With so many great local activities - including pristine parks, superb shopping, delicious dining, friendly fishing, and beautiful beaches - experiencing all Montauk has to offer is something that simply can’t be done in a day. We’ve put together this great guide so that you can get the most out of your trip to Montauk, no matter what your passion is. Check out the resources below highlighting some of the things your day can be filled with! Come get a piece of Long Island history at the iconic Montauk Point Lighthouse - the first and oldest lighthouse in New York State. It is also the fourth oldest active lighthouse in the United States, and a National Historic Landmark authorized to be created by President George Washington. With a height of 110 feet and 6 inches, the contour of the Island cannot be missed.The lighthouse is a host to several events including school trips and traditional group tours and the Annual Montauk Point Lighthouse Sprint Triathlon and Relay. You can even host your special event such as a wedding at this LI landmark. Don’t forget to pick up a souvenir at the gift shop. Montauk Lighthouse is a National Historic Landmark. Photo by: Erica Mengouchian. Enjoy some outdoor fun and get close with nature in one of the several parks in Montauk which include five state parks. Hither Hills has walking dunes and offers the most fun in the sun from playgrounds to camping to food. Shadmoor is known for its open geography perfect for birdwatching and shoreline views while picnicking. Montauk Downs is just the spot for those who like to play tennis or golf with the 18-hole golf course. Camp Hero consists of a National Historic Site with the former military base, a great 24 hour rich fishing location. Montauk Point State Park meets the Block Island Sound allowing viewers to see the two tides converge or watch some seals sunbathing on the rocks. Montauk has became a popular beach resort with over 5,000 acres of public beaches. Whether you like to sit and soak up some rays, swim in the sound, or take a walk along the shore, there is an open spot for you to experience the sound of waves washing up on the shore and the smell of the cool ocean breeze. Located on Long Island’s east end in Montauk, Gin Beach features a roped off area for swimming with watchful lifeguards. Visitors can watch as boats travel in and out of Montauk Harbor or take a walk on the jetty. Restrooms and outdoor showers are open to visitors.This beach is pet-friendly allowing off leash pets under voice control permitted 300 yards away from paved road. This small beach is just 500 feet from the ocean on the eastern end of Long Island. A picnic area is available in the park across from the beach. Ditch Plains Beach is a popular spot for surfers. On a bad day, the beach could see at least 50-plus surfers. On a good day, good luck finding room for yourself out in the water. Restrooms, two concession trailers, outdoor showers and sand wheelchairs are available. This beach faces Lake Montauk and is accessible to town residents with a town permit. Swimming is prohibited, but a comfort station is available, as well as picnic tables. Montauk is the home of one of the largest commercial and recreational fisheries. Montauk offers many boating options such as boat rentals for those who enjoy sailing, kayaking, and fishing. Go out to the sea in a charter boat or get a boat rental and take part in catching some fluke, bluefish, sea bass, striped bass, swordfish and even shark! If you plan on going on your own, be sure not to get caught without a fishing license. But, if you are going out on a party boat, they got you reeled in and covered with their party boat fishing license. Located only minutes from Montauk Inlet, this full service marina offers complete facilities for 150 boats and all of your fishing needs. Montauk Marine Basin is also close to all the main attractions in the area! This upscale waterfront resort features 107 rooms and villas along with a 232 slip marina. The Montauk Lake Club is a sport fisherman’s paradise, supporting Montauk’s world renown reputation as the premier place for Long Island fishing. Located midway down the protected eastern shore of Montauk’s safe harbor, the Club provides an easily accessible deep water marina to keep your boat. Also known as Montauk's Friendliest Marina, Montauk Sportsmans Dock is on the West side of Montauk Harbor only a few hundred yards from the harbor entrance. Whether you need dockage for your boat on a seasonal basis, or if you're just passing through Montauk on an extended cruise, this dock is the perfect choice for a quiet, cozy environment during your stay. Boaters and fishers come from all over the Island and up and down the East Coast to enjoy the excitement of seasonal sport fishing and access to an extensive fleet of charter boats. No marina in the area offers more facilities and services. Located in Montauk Harbor, Uihlein's Marina, Motel, & Boat Rentals has a fleet of 18 boats as well as 8 jet skis available for rental. Trained instructors will ensure you have a terrific time while staying safe. Home to 17 of Montauk's finest sportfishing charter boats, book a fishing trip through their Charter Service. This marina also offers seasonal and transient docking, a fully-stocked tackle shop, all inshore and offshore baits, bulk ice and more! Too busy to take a vacation this summer? Do you have a low-budget but are looking for something to do? Want a few hours to just relax and get away from reality? Take a two hour evening Sunset Cruise and experience the beautiful scenery of the sun setting on the water as well as the lighthouse. You can go with your family, bring a whole crew with you, or have a romantic night with that special someone. A long day of fun in the sun in the ocean water can really wipe you out . Surfed up an appetite? Enjoy the local seafood freshly fished up from the luxury of our own port. Don’t like fish? With a variety of restaurants from gourmet to fine dining to a simple slice of pizza, there is something for everyone. If the weather is a little cool, get cozy inside a restaurant. For those who like the night sky can enjoy their meal outside in the warm summer nights with the ocean view. The Sea Grill at Gurney's Inn serves fine seafood in an elegant dining atmosphere suitable for weddings and private engagements overlooking the ocean in Montauk. Located on the waters in Montauk for 12 years, this venue is famous for its seafood dishes. John's Pancake House is a popular family breakfast and brunch restaurant in Montauk. The Point Bar and Grill in Montauk specializes in steaks and seafood, served in a casual dining atmosphere. Get the perfect jumpstart to your day at the Montauk Coffee Shop. Planning on staying awhile? Find the perfect place for you to kick back and relax in Montauk by choosing the right hotel for you including bed and breakfasts. Looking to stay for more than just a while? Enjoy the oceanfront and luxury of the sun at your own privacy by renting out a vacation house. Those who are local can even enjoy the company of their friends and families or simply the beautiful view of the ocean. If you are considering taking a trip, transportation options include the Long Island Railroad, car, or ferry! If you're looking for fun things to do in other great places on Long Island, check out our other Guides for Sag Harbor, The Hamptons, Northport, Greenport, Port Jefferson, Ocean Beach, Fire Island and North Fork!